Romain Navarrete admits tomorrow afternoon’s clash with Catalans Dragons will be personal for him. The Frenchman has impressed both Warriors coach Shaun Wane and fans so far this season after coming back into the fold. Navarrete moved back to Catalans on loan last term after feeling homesick during his first season at Wigan, but only made four appearances for the Dragons before making the decision to try again to break into the Warriors team. And now the 23-year-old wants to show Catalans coach Steve McNamara what he’s missing out on. “I have something to show the Dragons,” he said. “Last season I went back on loan and didn’t play a lot of games. The coach Steve McNamara didn’t give me his confidence so it’s revenge for me. I want to show him what I can do, and my skills. Navarrete enjoyed a strong performance in last Monday’s 44-6 win over Hull KR and kept his place in Wane’s squad along with Australian recruit Gabe Hamlin, who made an eye-catching debut. And with the challenge of keeping his place, Navarrete admitted memories from last season are acting as a further incentive to improve. “With what happened last year, I think some fans might have blamed me so I’m really happy to impress them and have the fans behind me,” he said. “Last season I felt homesick and needed to be back. “But at the end of last year I realised something, what I missed and I know I can win trophies here. 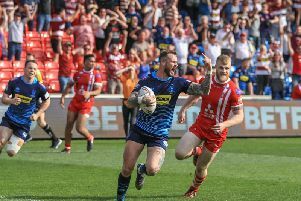 “I don’t want to say I don’t think I could have won trophies at the Dragons but there is more of a chance at Wigan and particularly with this team here. Navarette will also get to play in front of many of his family for the first time in a Wigan shirt today. He missed Wigan’s 32-10 win in Perpignan last July, five days before going back to the Dragons on loan, though his sister flew to the UK to seem him play in last month’s 30-18 win over Wakefield. “It’s a pretty big day. I’m really happy to be in the team, particularly against Catalans in front of my family. It’s a big game for me,” he said. “Last month my sister came over for a few days and I played against Wakefield the weekend she was there. For my mum and family it’s the first time they’ve seen me. Meanwhile, coach Shaun Wane admits it will be difficult to see ex-Warrior Michael McIlorum line-up against his side. McIlorum spent 10 years in with Wigan before leaving for the 2018 season in a move which shocked many fans. “It’s sad for me. I’m looking forward to seeing him but gutted we’re playing against him to be honest,” he said. Meanwhile, McIlorum, who made the move from Wigan to Perpignan in January, says he is aware of the speculation surrounding close friend Sam Tomkins and is hoping it comes to fruition. “I’ve heard of it,” McIlorum said. “Obviously if we could recruit a player of his calibre for next season it would be great for Catalans. I’m hoping there’s something behind it. The Catalans fans will have a chance to watch Tomkins close up when Wigan play the Dragons in the round 10 league fixture. Neither Wigan nor Catalans have made any comment and the Warriors made Tomkins unavailable at short notice to the media at coach Shaun Wane’s weekly media opportunity.